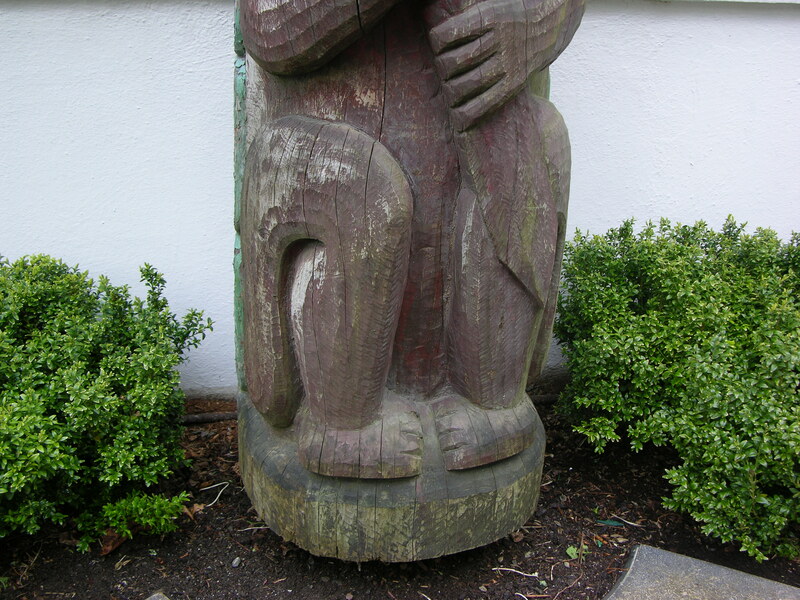 Southeast Alaska is the land of totem poles. These iconic outdoor sculptures are powerful, valuable, and remarkably vulnerable. The Tongass National Forest, covering 80% of Southeast Alaska, is a temperate (cool) rainforest, with precipitation between 80 and 100 inches per year in most places where totem poles are made and displayed. (In comparison, Seattle’s annual precipitation is usually under 40”.) Imagine placing a wooden pole in the ground and exposing it to the weather for decades. Utility poles, which are heavily impregnated with preservative chemicals, typically last 25-50 years in much less aggressive conditions. 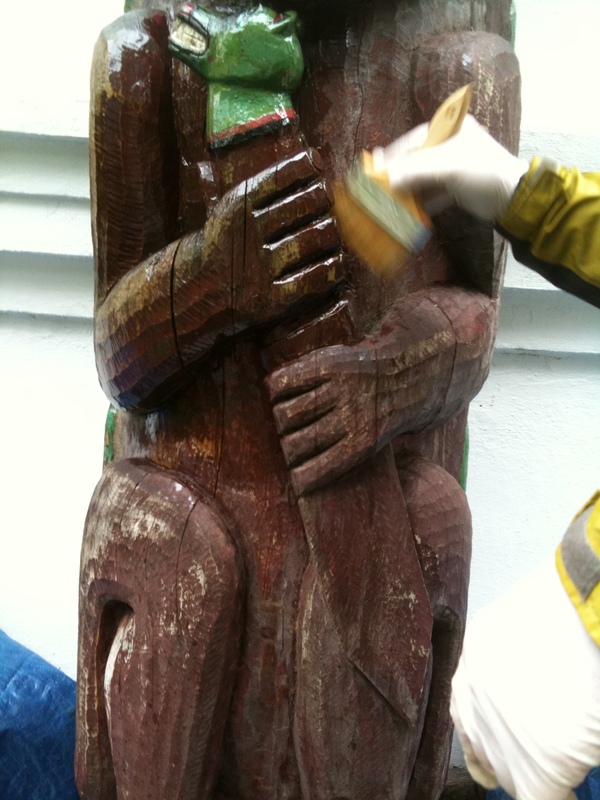 Most totem poles are not treated with preservatives when they are erected. 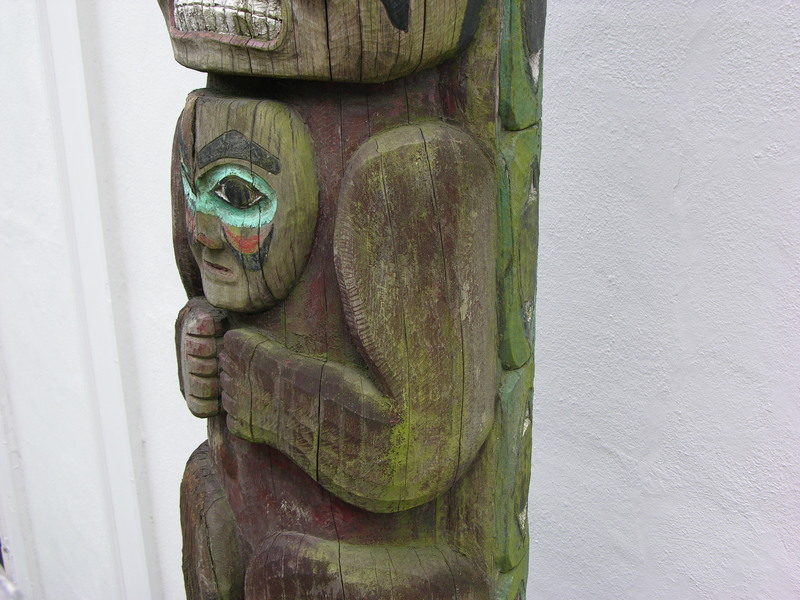 SUMMARY: If you are responsible for the care of a totem pole in an outdoor environment, a maintenance/inspection schedule should be developed and carried out. 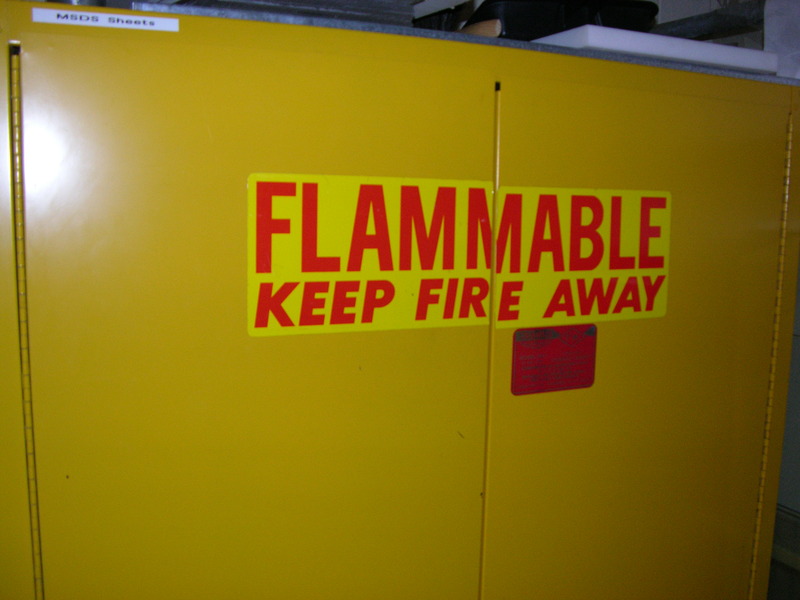 Inspections should check for loose parts, damage, and signs of decay or insect infestation. Borates and water repellent should be periodically applied. Borates help protect against rot and insects, but are water soluble. 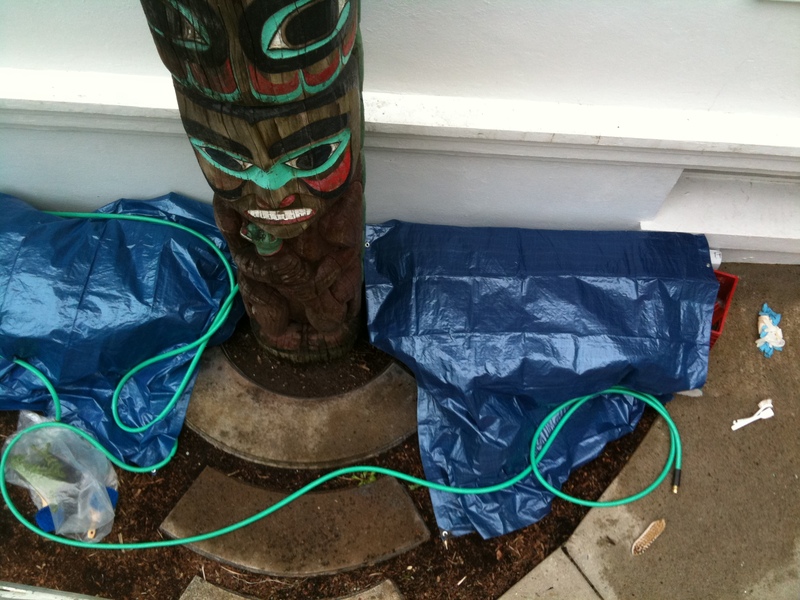 Water repellent protects the pole and prevents the borates from washing out with the rain. The application of borates and water repellent should occur every 3 – 5 years, depending on when the water repellents have worn off (water no longer beads up on the surface of the wood.) 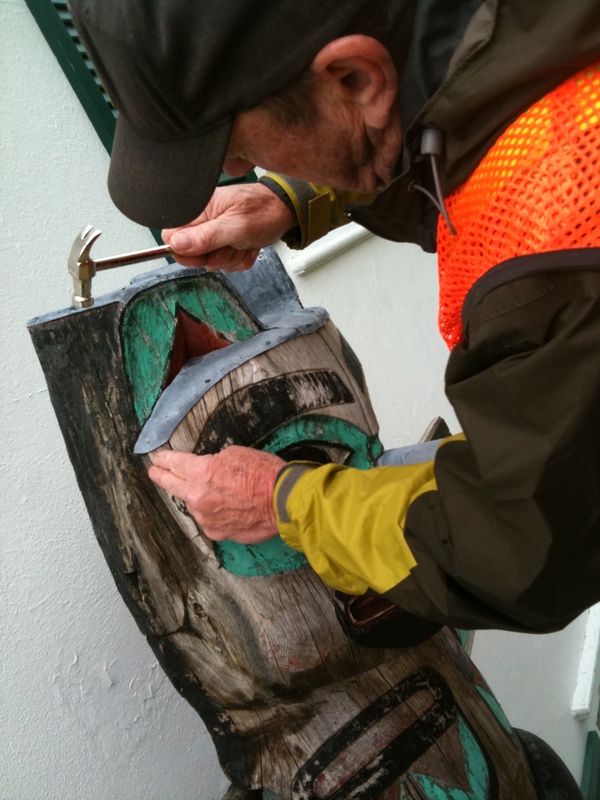 If the totem will be moved it is recommended to contact the Native community to allow them the opportunity to comment and to be involved with the preservation process. Moisture management is key to preservation. Proper drainage around the base of the pole and lead or copper caps at the top help preserve the wood. Typically, if you set aside a week to do the work, that’s plenty of time and allows for vagrancies of weather. INSPECTION: Every time a pole is taken down, there is a risk of damage. Better to leave it vertical if possible. This is fine for inspection and cleaning, but perhaps not convenient for the detail work painting and re-carving may require. Sometimes scaffolding is used. 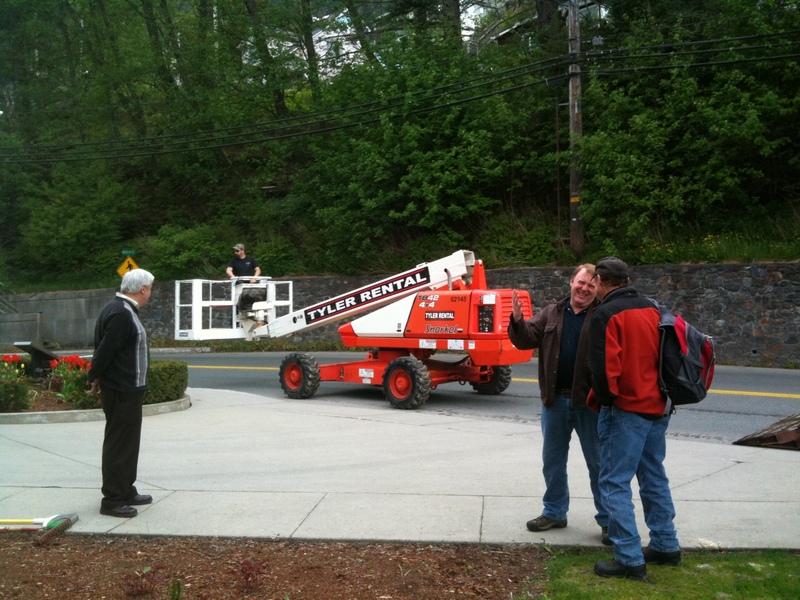 Rental of an electric or diesel boom lift is very helpful for maintenance purposes. A lift can usually hold two people if the total is under 500lbs. Note the importance of wearing a safety harness while on lift. In addition to the obvious safety issue, nothing brings out the local newspaper photographer like work on a totem pole, and a front page photo of you on a lift with no harness is an easy way to get a fine from OSHA. A few hours may be spent photographing, taking condition notes, measuring cracks, and probing the wood with an ice pick. When wood is damp, the hole from the ice pick swells back shut right away, leaving no mark. Plants near the base should be removed to promote air circulation and drying at the base of the pole. Missing, loose, or detached elements. Inspect any lead or copper caps as well to see if they are loose or have missing or rusting nails. Color and degree of soiling and biological growth (ie “localized green patches of biological growth” or “overall black biological growth” or “moss and lichens forming on the upper surfaces of the arms”) Look, too, for evidence of insect infestation. 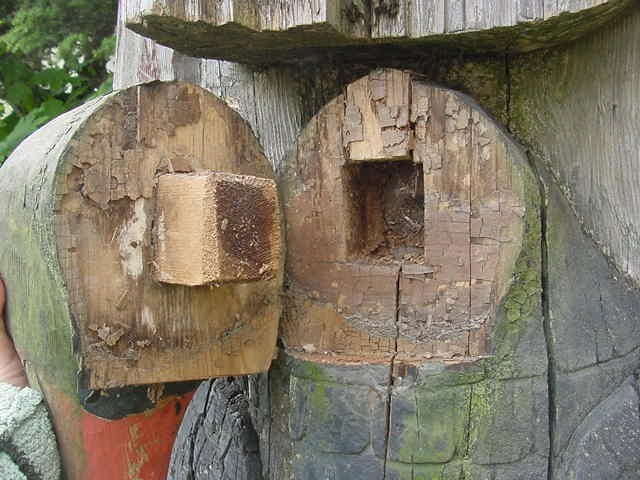 Some insects, like carpenter ants, will make their home in rotted wood. Large Cracks. 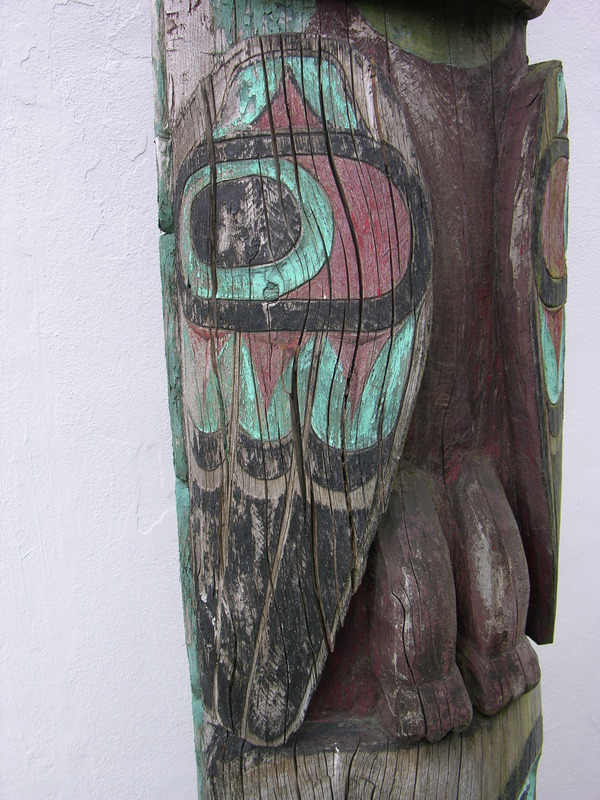 Totem poles always have cracks. I just keep an eye on the largest ones, and perhaps take a measurement or two of crack width. Photographs are a better way to keep track of overall cracks than written notes. Rotten areas. Using an icepick or a sharp steel awl, push the point into the wood and see how deep it goes. It is best to do this when the wood is damp anyway, as the hole will swell shut quickly. Sound wood will not easily allow penetration of the awl, while rotting wood will allow the tip to go in without much resistance. 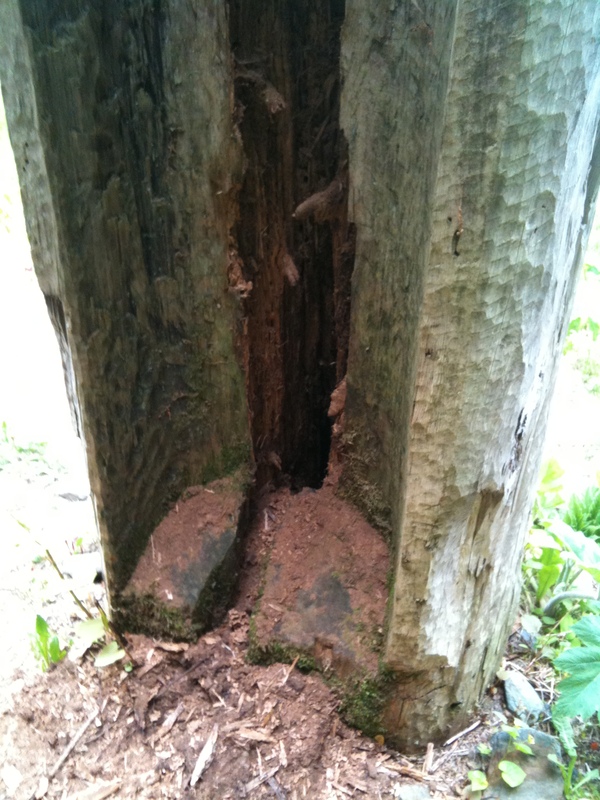 If the pole is directly in the ground or in concrete, the base may have rot. Sometimes the base is solid on the outer layer, but underneath there can be soft areas and loss. 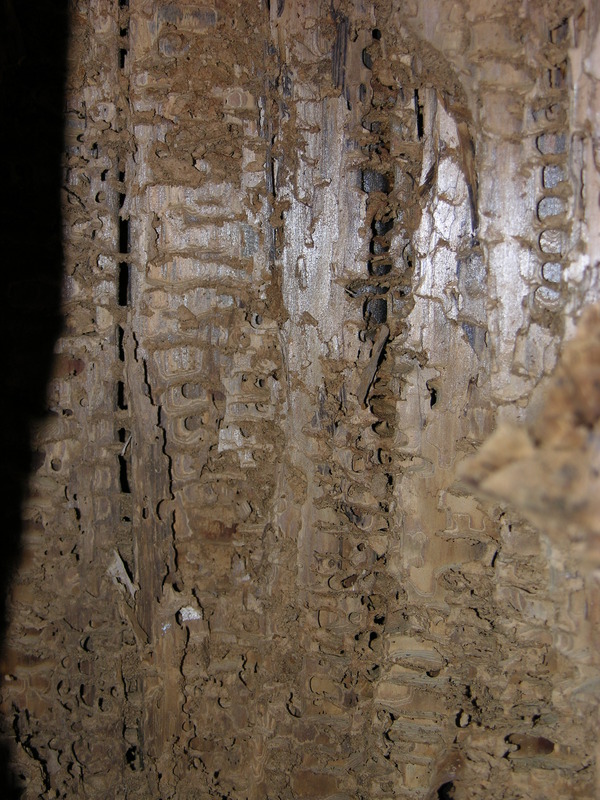 It is not uncommon for there to be rot beginning at ground level and extending down down 18-20” until the wood is more sound again, deep underground. 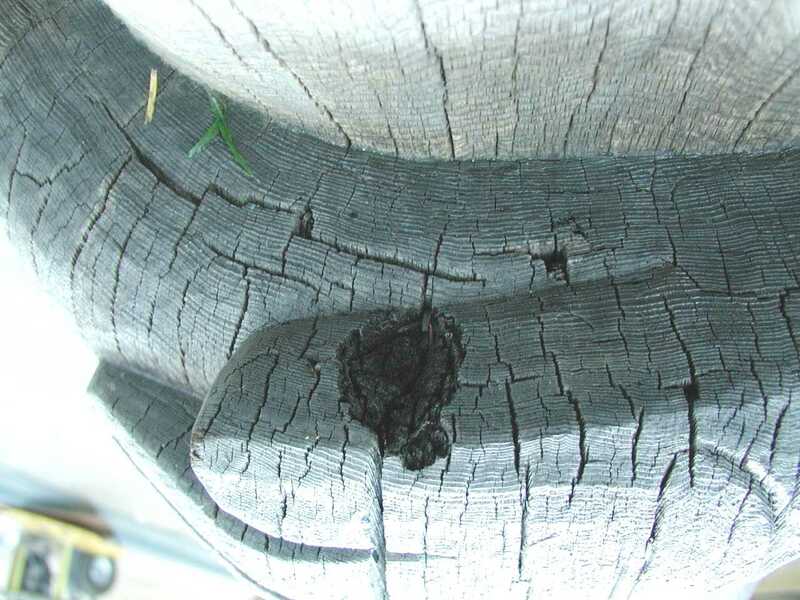 Upper areas of the pole often have more rot than lower figures, and there is usually one side of the pole that suffers more intense weathering. 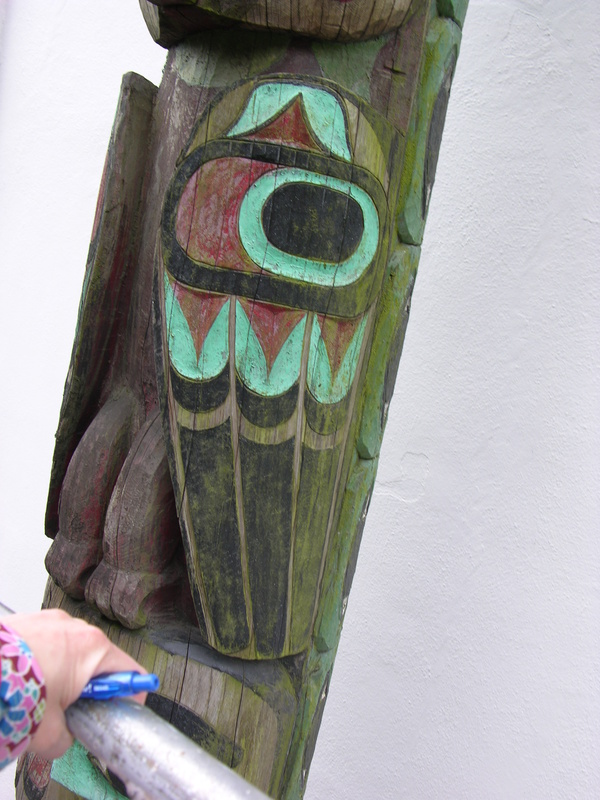 If available, a Resist-o-graph is very helpful, especially around the base of a totem pole. The tool is a drill that measures resistance of the wood, indicating location and depth of decay. The drawback is the cost of the equipment, perhaps around $12,000. However, sometimes one can be found or contracted though specialist companies or govenrment agencies. I have heard of this tool being used on various Alaska projects by the National Parks Service and by the private company Extreme Access, an Oregon-based inspection and testing company. Ivory soap and warm water can be mixed in a bucket to make a cleaning solution. Use just enough soap to bring up bubbles when you swirl your hand in the water. 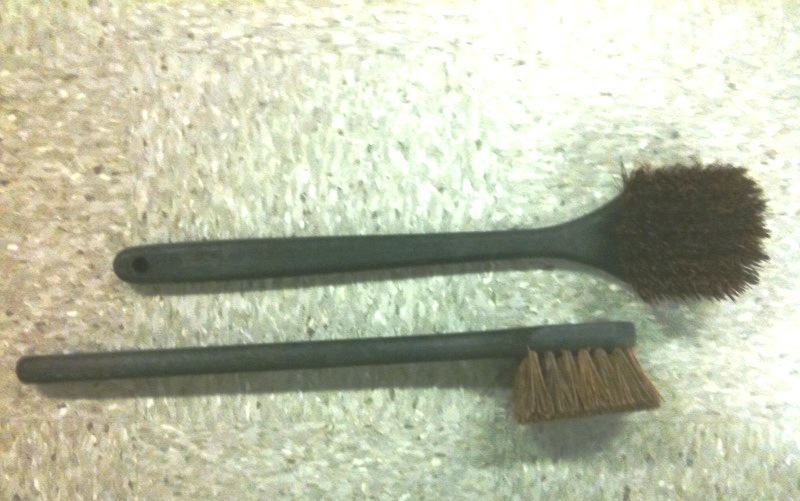 Vegetable fiber or nylon scrubbing brushes work well, and a long handle is your friend. Smaller dish-washing sized nylon brushes are very helpful as well, to clean more detailed areas of carving, under noses and the like. Start from the top and work your way down, rinsing with a garden hose as you go. If biological growth is especially thick, you may find popsicle sticks and bamboo skewers useful to help scrape it off the surface. Remember not to use tools that are harder than wood or you may damage the pole. Occasionally, totem poles may have grass or small trees growing from them. In those situations, it is probably better to cut off the growth flush with the wood, since pulling out big roots can cause more damage and create empty spaces for water to pool. Biocide: Bora-Care is a brand name of a water-soluble solution of sodium borates in polyethylene glycol. http://www.nisuscorp.com/portal/page/portal/Nisus/categories/homeowners/products/boraCare It will not penetrate well where there is paint, and penetrates best at endgrain areas. Borates will soak in readily in endgrain areas like tops of these arms. Apply until it no longer soaks in. In larger amounts it can kill surrounding plantings and grass, which should be tarped when it is used. 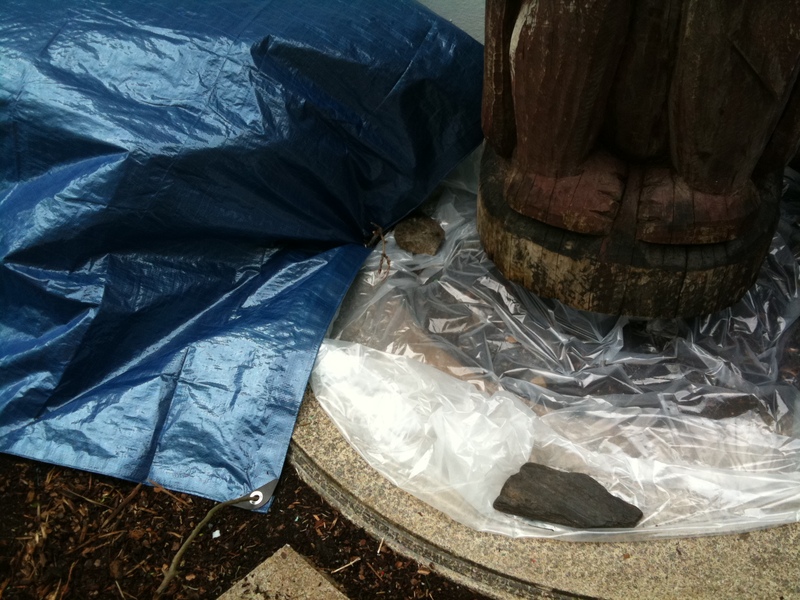 Cover surrounding foliage for application of both borates and water repellent. It provides residual protection against biological growth, but must be used in conjunction with a water repellent, or it will be leached out prematurely by the rain. As a borate salt, it is hygroscopic and will travel within the pole, continually attracted to water (ie areas of prospective rot) and provide ongoing protection. The product works against insects by interrupting the digestion of nutrients, starving them to death. Bora-care mixes one-to-one with water for application, and the mixing goes much better with warm water. 1 ½ gallons of Bora Care (mixed with equal amount warm water) is enough for a typical 30-foot pole. Use a 6” metal strainer over the opening of the garden sprayer when pouring the mixed borates as a precaution against the sprayer getting clogged. A 2-gallon hand-pump garden sprayer helps greatly in application: you avoid the mess of a sloppy bucket, can spray deep into cracks and endgrain, can reach around the back of the pole more easily, and access hard-to-reach areas like wings. Working with two people is much easier than working alone, as one person can spray and the other can back-brush for improved penetration. 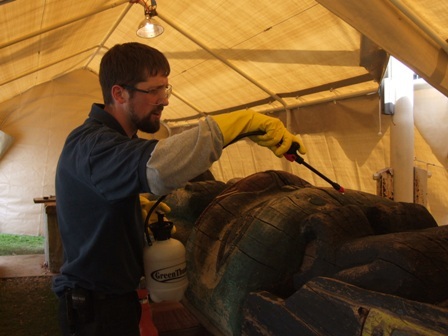 Bora-Care can be applied while totem pole is still wet from washing to aid in the penetration of the borates. Wearing gloves helps keep your hands clean, as the Bora Care is rather sticky. Borates are also available in a solid stick as “Impel Rods.” These are useful for placing inside big voids or cracks, or under caps and in loose mortise and tenon joints before re-adhering. They are a little larger in size than a stick of chalk, and can last around 10 years. 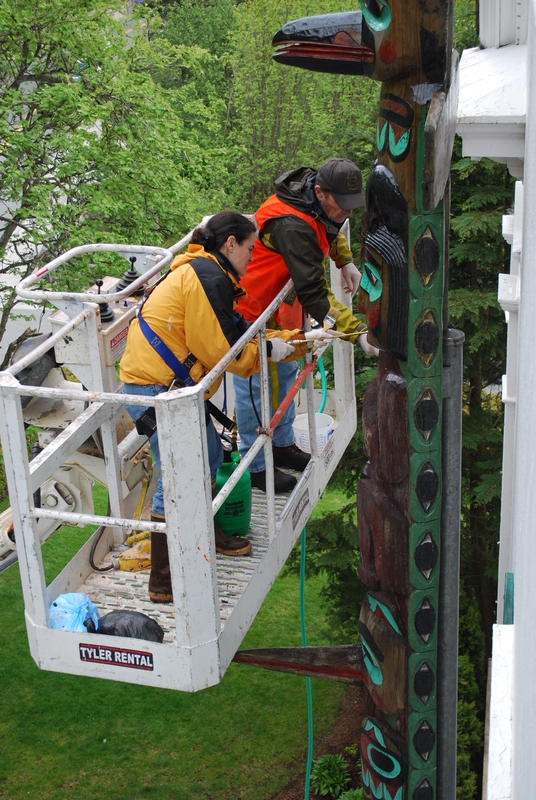 You would not want to drill any new holes for putting in the rods, as this is counter to conservation ethics of preserving the original material of the totem pole. An exception may be at the base or below ground of buried totems. Washing and applying borates is usually a good day’s worth of work. 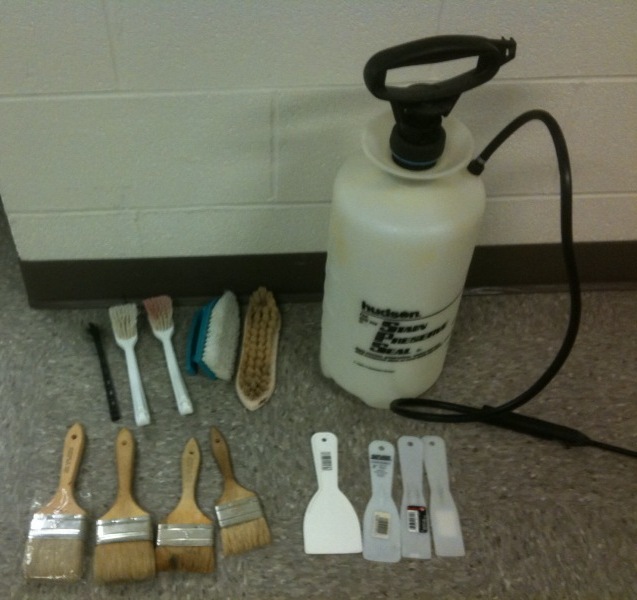 Water repellent: A quality water repellent should be applied after the wood dries from the application of the Bora-Care. It is best to have a drying day in between if possible. Paraffin-oil based products are desirable, and your water repellent should be breathable and non-film forming. UV inhibitors and fungicides are also good ingredients. 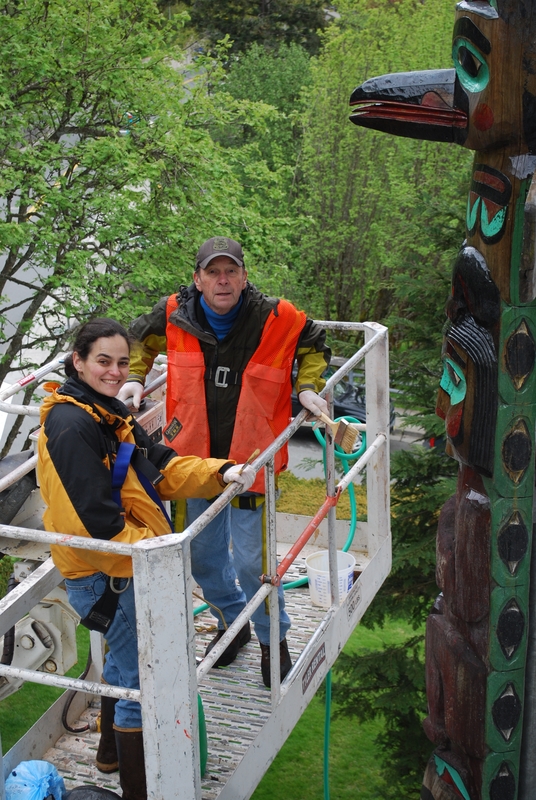 The totem poles in Southeast Alaska are most frequently protected with X-100 Natural Seal Wood Preservative. http://www.abrp.com/pdf-files/spec/WOOD%20PRESERVE%20SPEC.pdf This product is also used by the National Parks Service and Parks Canada. Apply repellent slowly with the sprayer, starting at the top and working your way down, back brushing and preventing excess dripping and mess as much as possible. The need for the 2-gallon garden sprayer and the use of two people is the same as for the borate application. Approximately two gallons of X-100 water repellent is adequate for a typical 30-foot pole. 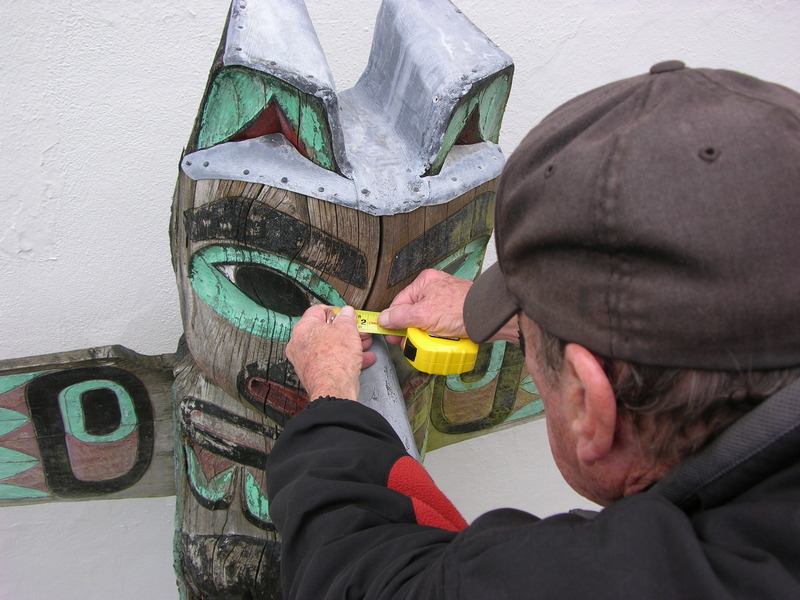 Caps: Custom-fabricated metal caps are used to prevent penetration of water into the end grain of the wood, particularly on the top of the pole and upper surfaces of beaks and arms on the higher figures of a totem pole. Done well, these are almost invisible from the ground. Capping used to be controversial, because some people were concerned that water would get trapped underneath and cause accelerated rot. But Ron Sheetz removed some old CCC-era lead caps from poles in Sitka Historical Park and found that they were in much better condition than the poles that were not capped. For one in particular, the Twin Village Watchman (it was too tall for a lift so he had to go up in a crane with a cage!) the cap had blown halfway off and you could compare the two halves. The half that was still capped was much better, looking almost like new wood. The uncovered side was black and cracked and starting to rot. If the cap covers the end grain fully and allows for runoff, you won’t trap moisture underneath. Lead caps protect exposed endgrain. Sheet lead works the best, since it can be cut and conformed to the surface easily with pressure from the hands and the careful use of a hammer or rubber mallet to gently trace over the three-dimensional carved shapes. Copper sheeting can also be used, but must be cut and lapped, so it is not as easy to form to the complex shapes of the carved surface. Thinner lead is better. Ron Sheetz has been using 1/16” lead or less…the thinner the better. 1/32 would be ideal, but it can be hard to find thin lead. Ideally, you would roll it down in a roller (such as at a machine shop,) but you can’t always find one in the community where you’re working. The lead turns a nice gray within a couple of days and really blends well with the weathered color of the pole. It becomes nearly invisible. 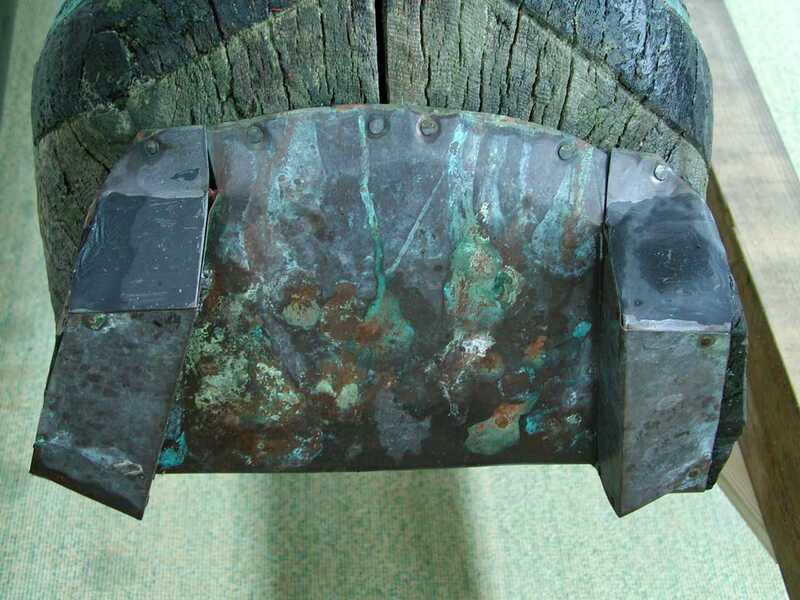 Copper eventually darkens to an unobstrusive color, too, but it takes much longer, and there is always the concern of greenish or grayish copper stain streaks. Ron Sheetz replacing loose nails that were too short with longer ones. 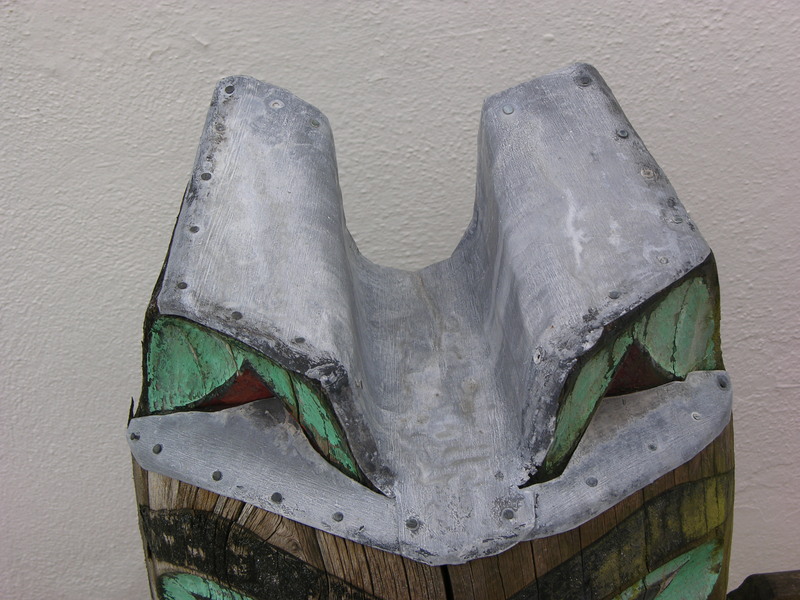 Stainless steel, copper, or galvanized nails should be used to attach the caps. Length of nail depends on the quality of the wood. Need to go deep enough to bite into solid wood and not work loose. If nails work loose, don’t just tap them back in. There’s a reason they have pulled out, perhaps were not long enough. Select longer nails, perhaps with rough edges like textured stainless steel nails, and they will have a better bite. 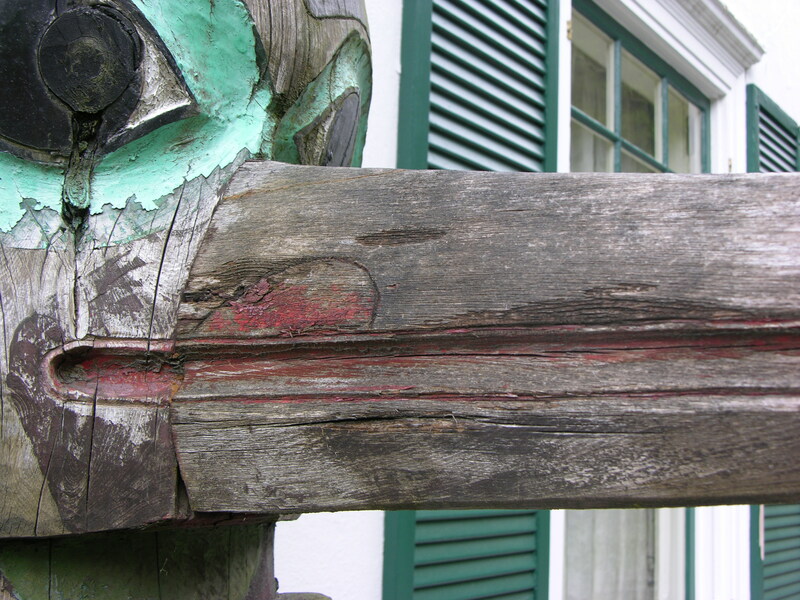 Poles mounted directly in the ground or in concrete inevitably develop rot at the base in the wet climate of Southeast Alaska. 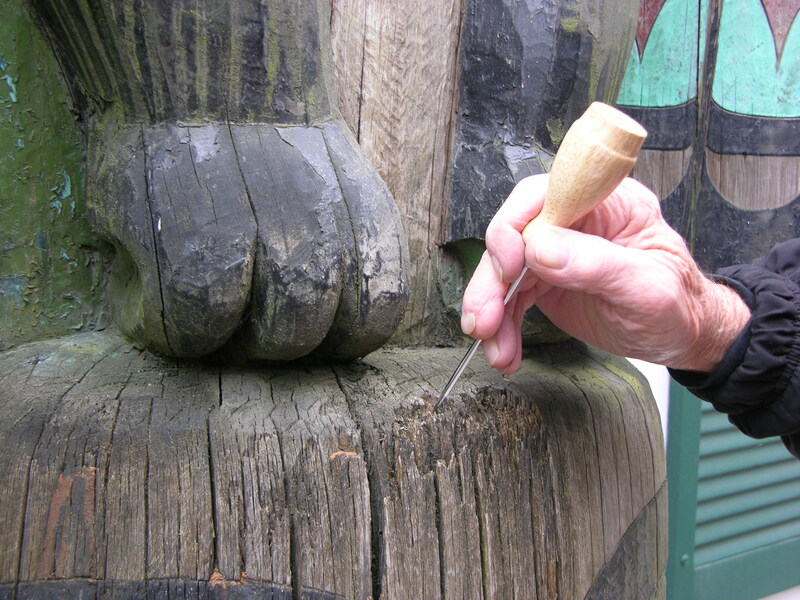 Putting a pole directly in the ground was the traditional way to display a pole, but when those poles deteriorated, the tradition was to have them re-carved or replaced. 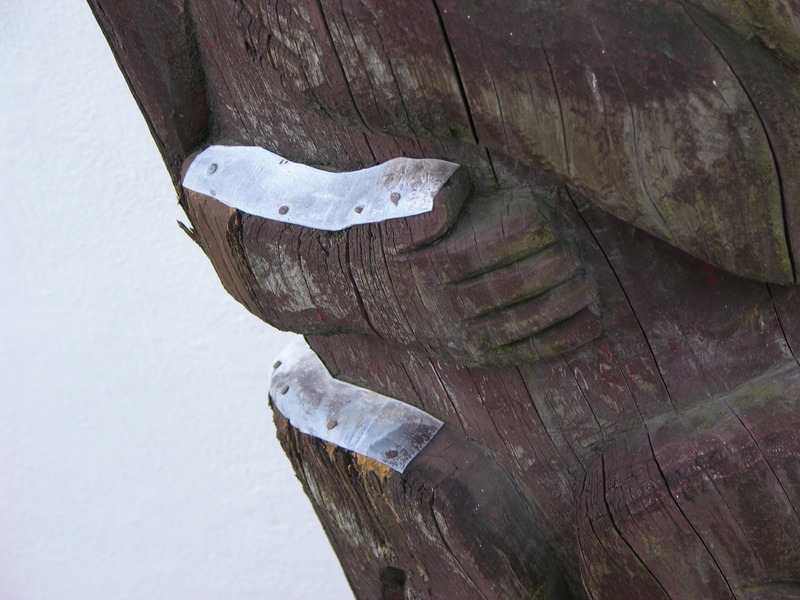 There is often a desire today to preserve poles in the outdoor environment as outdoor sculptures by known artists, objects in museum collections, or significant municipal investments in public art. Many of these poles today are mounted on a metal support attached to a concrete base. The metal support is engineered to extend up approximately 1/3 of the total pole height. This distance could be greater if good solid wood is not available within that length of the pole. Holes are drilled through the front of the pole, bolts extend into the metal support and the bolt holes are recessed and plugged. The weight of the pole should also be supported at the base by a small shelf of metal attached to the strong back. Bolts go up into the bottom of the pole through that shelf. This prevents the bolts in back from holding the entire weight of the pole. Elevating the pole’s base several inches above ground level will keep the pole out of the soil and prevent water seeping up into the base. 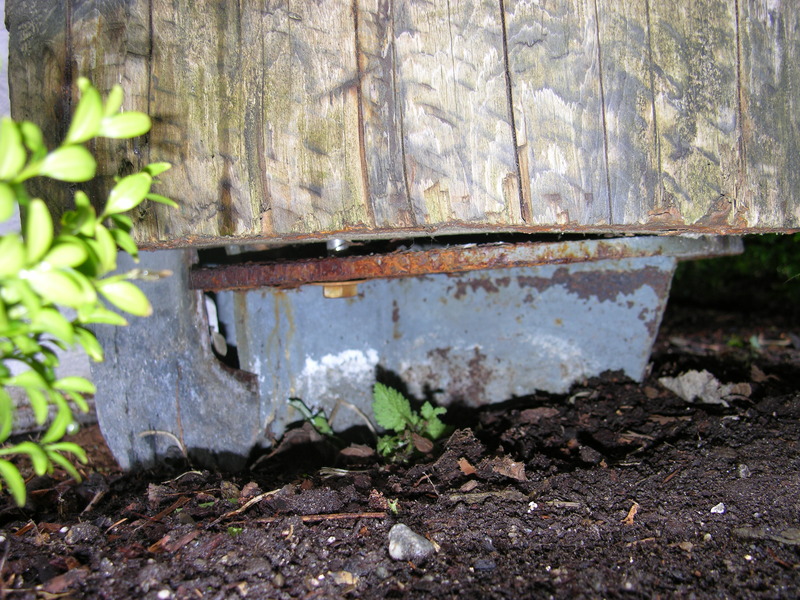 The metal support mechanism up the back of the pole must have strong underground footings and is usually itself mounted in concrete underground. 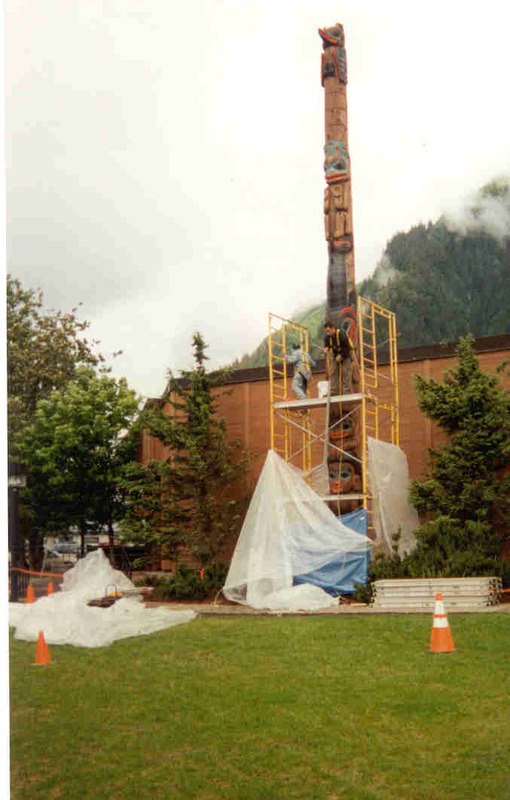 Examples of poles mounted with metal support poles are at the governor’s mansion in Juneau, Totem Bight in Ketchikan, inside Juneau-Douglas High School, and the Juneau-Douglas City Museum. The pole will look a little darker and the colors more saturated for a few weeks following application of borates and water repellent. The grain pattern will also be more visible for a while. This is particularly true while the oil-based water repellent is drying. In a few weeks, these temporary changes will fade and the pole will be back to its natural look. If you need more advanced treatments (re-carving or painting, epoxy work, new mounting etc) start thinking about fundraising and identifying companies or volunteers to donate time and services. 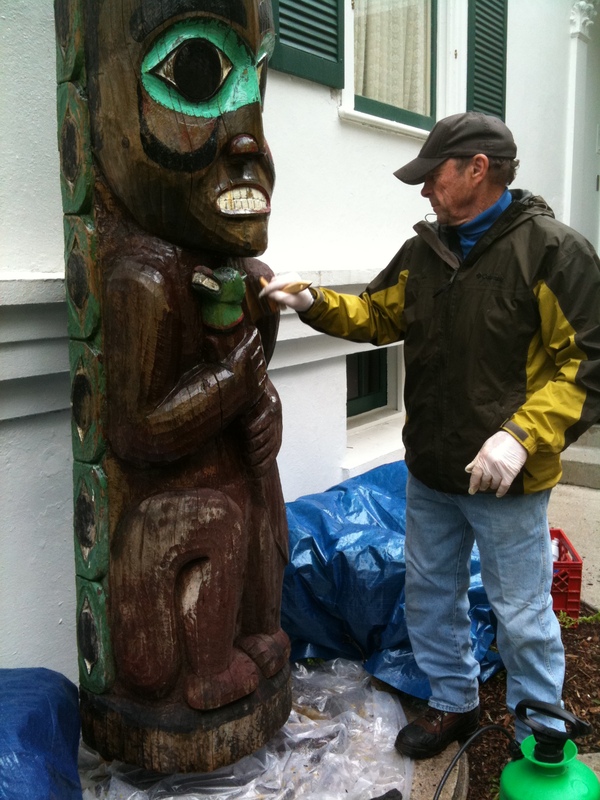 Performing preservation treatment will definitely help prolong the life of a totem, but to really preserve a totem, it will have to be placed indoors. 1 gallon buckets. The kind with measurements on the side are nice. 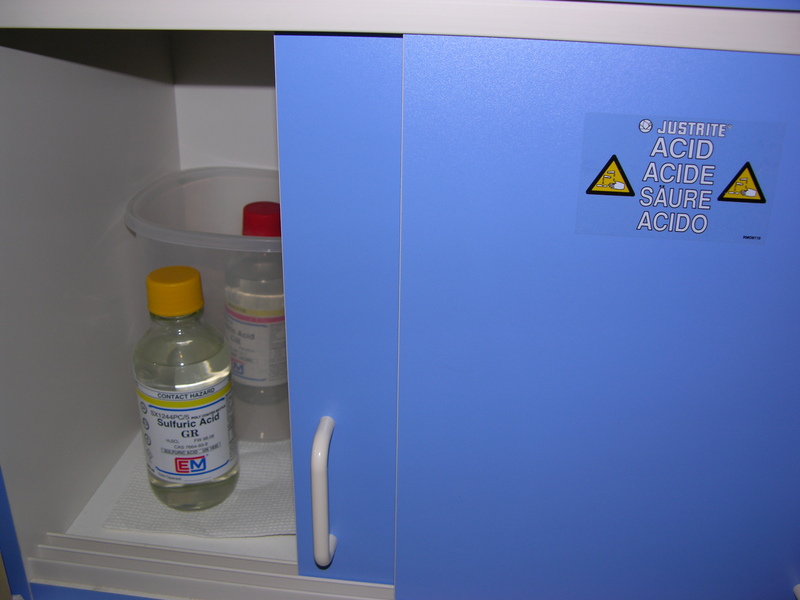 Bora-Care Biocide containing disodium octaborate tetrahydrate and ethylene glycol, made by Nisus corporation. Approximately $100 per gallon now, available from Wood Care Systems. X-100 Natural Seal Wood Preservative. Paraffin oil-based water repellent. 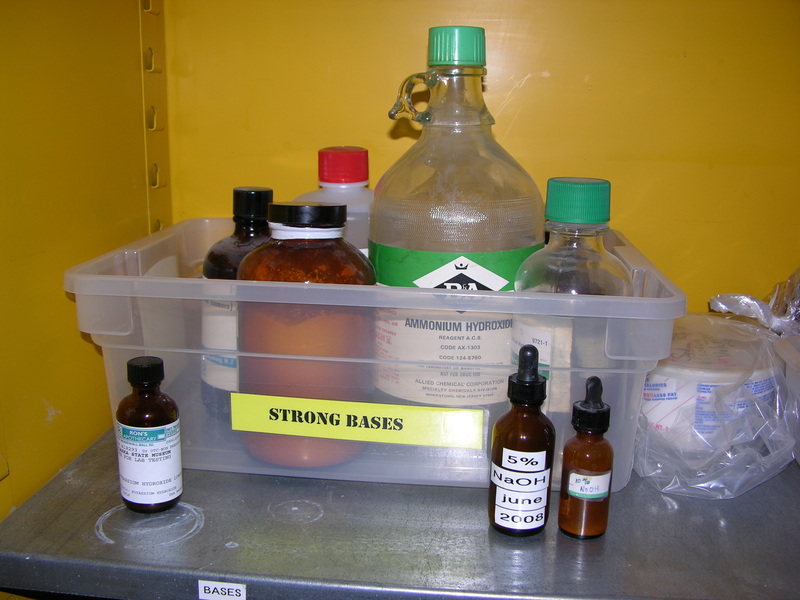 Note: this is an internal document I produced to help properly organize the chemicals in my conservation lab for safety and inventory purposes. In some cases I’ve made extra notes for myself about what the chemical may be used for. For a few of them, I’m not sure. Many of these pre-date my time here, as there has been a conservation lab at the Alaska State Museum since 1976. 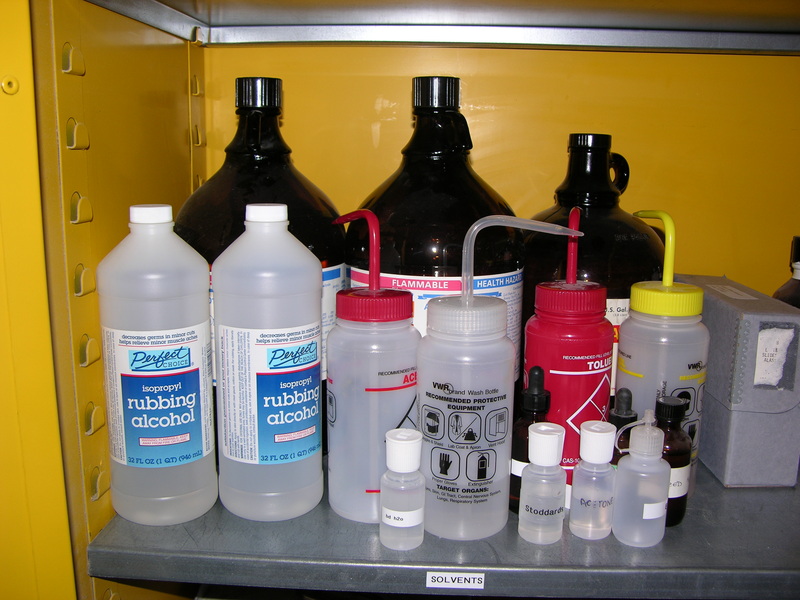 I am in the process of determining how many of these chemicals to keep, as good lab hygiene suggests not keeping more than is needed. 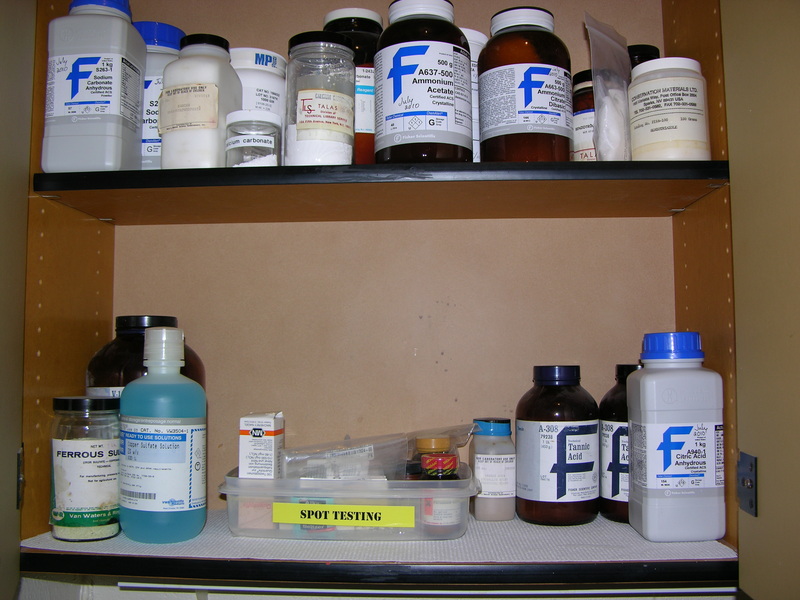 However, some of these chemicals have been used on collections, and keeping them may help inform future conservation treatments. There are also many things on this list that I will likely never have again if I get rid of them now. 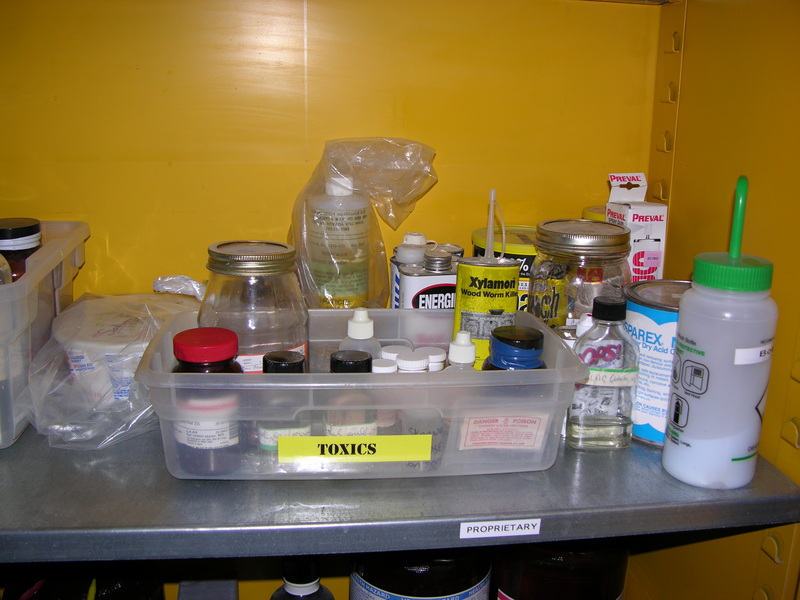 I’m posting the list for you here to show what kinds of chemicals a typical objects conservation lab might have, and to invite commentary on either my safety decisions or the uses (maybe obsolete?) of these substances. Please feel free to comment, as it would make the posting more useful. Sodium Perborate Dec 1997 in a plastic cool whip tub Mild bleaching solution used in textile conservation? Carusorb pellets 400g glass bottle full 5 % potassium permanganate on alumina filter for organic gases such as formaldehyde and acetic acids, turns from purple to brown when used. Ascorbic Acid, Sodium Molybdate Dihydrate, Potassium Antimony Tartrate, Potassium Pyrosulfate in small plastic jar Spot testing? 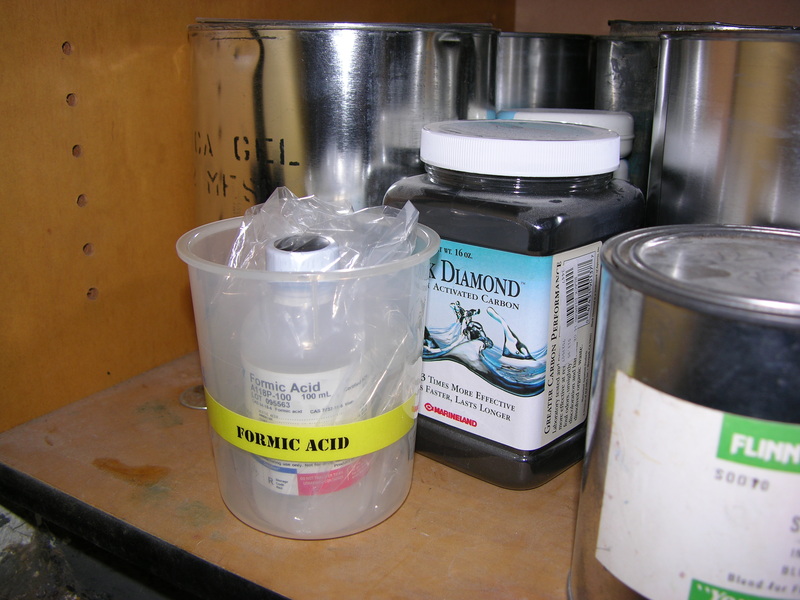 Potassium Iodide, Lithium Hydroxide monohydrate small plastic jar spot test? 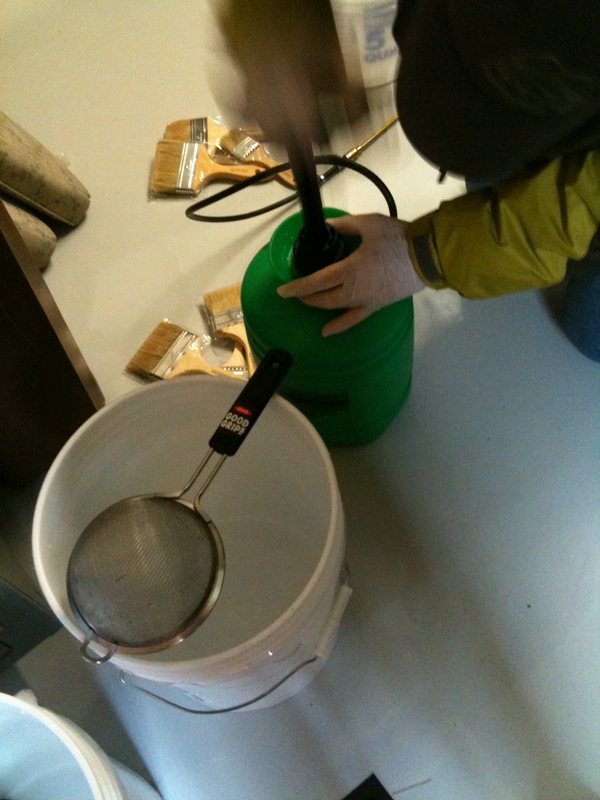 Sodium Carbonate, Sodium Sulfide, Ammonium Chloride, Erichrome Dye plastic jar spot test? Xylamon wood worm killer 4.2 fl oz metal bottle (60% full) Contains Lindane (gamma benzene hexachloride) C6H6Cl6 100x more toxic than DDT and an organic pollutant. Possible carcinogen. Ceresin Leather Dressing 1 pint glass bottle (70% full) Ceresin is a wax similar to paraffin, probably in ethanol. Used for paper and textile sizing and for leather dressing. 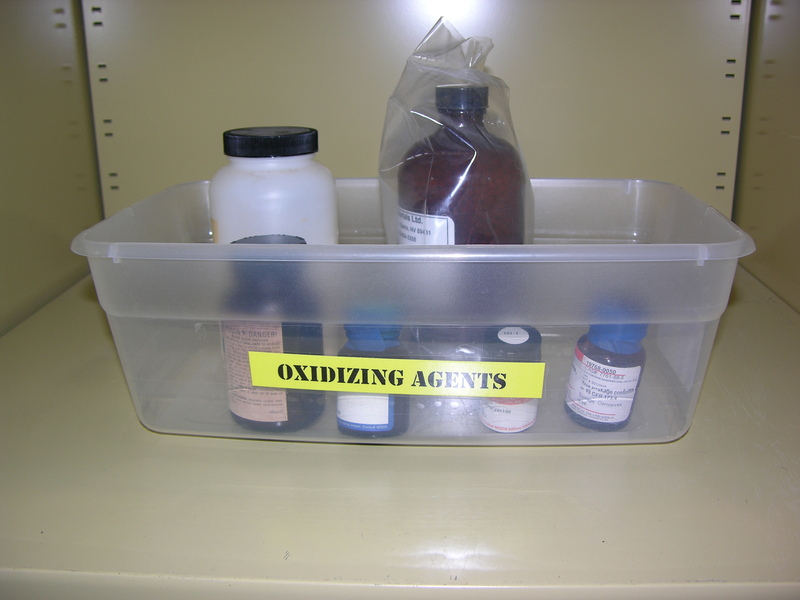 Also on shelf: Box with small plastic dropper bottles used for site visits: toluene, Stoddards, xylene, distilled water, acetone, and ethanol. Versene Fe-3 Flake 1 lb glass jar (50% full) Versene is a chelating agent, possible to remove rust stains? Sorbitol 500g glass jar (90% full) Sorbitol is a simple sugar used as an emulsifier or humectant. More absorbent than glycerol. Orvus Paste 1 pint plastic jar (30% full) Orvus is an anionic detergent, sodium laurel sulfate? Enzyme Lipolase in glass jar with plastic bag. Full. Enzyme Alcalase in glass jar with plastic bag. Full. Enzyme Celluzyme in glass jar with plastic bag. Full. You are currently browsing the Ellen Carrlee Conservation blog archives for August, 2010.